chapter too | take your marks. go. One of my favourite things about being back in Melbourne is the opportunity to brunch. 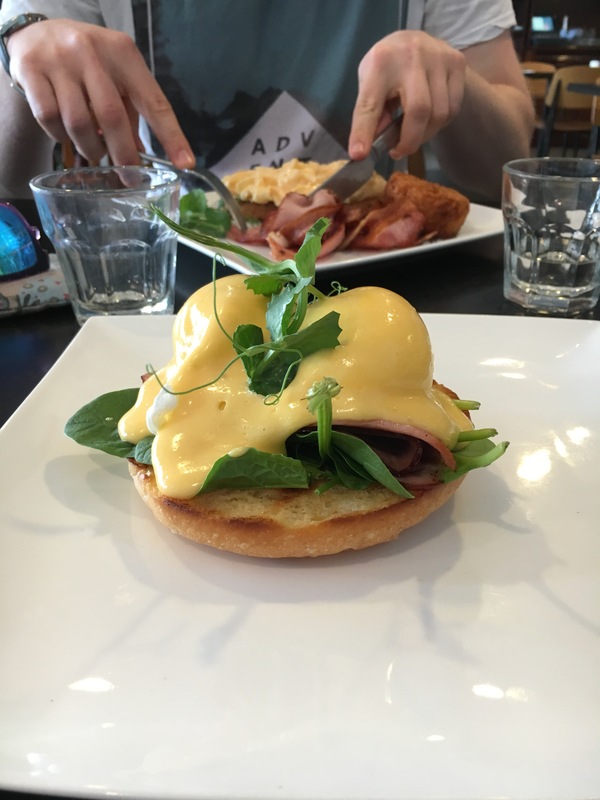 I hadn’t realised quite how much of a guilty pleasure brunch was for me, but within a few sniffs of coffee that first morning in Melbourne I was hungry for some eggs Benedict. There’s a cafe just down the road from our house that we’d been meaning to go t before we left, but one thing always led to another, or Zac wasn’t in the mood for brunch, or we’d already ended up at Mr. Pilgrim, so it just never happened. I’d sort of forgotten about my birthday, with other much more exciting events in the pipeline for us, so when Zac said they wanted to take me for brunch for my birthday, we sort of knew it had to be Chapter Too. Already knowing what I wanted I had chance to have a look around while I waited for my mocha. The back wall of the cafe is covered in old books that have been whitewashed over, with the silhouette of flying birds painted across to create a huge feature wall at the back. I’m not sure how I feel about this: I love the way it looks and I love the idea of repurposing the old books…but the books! It’s a form of sacrilege to me. 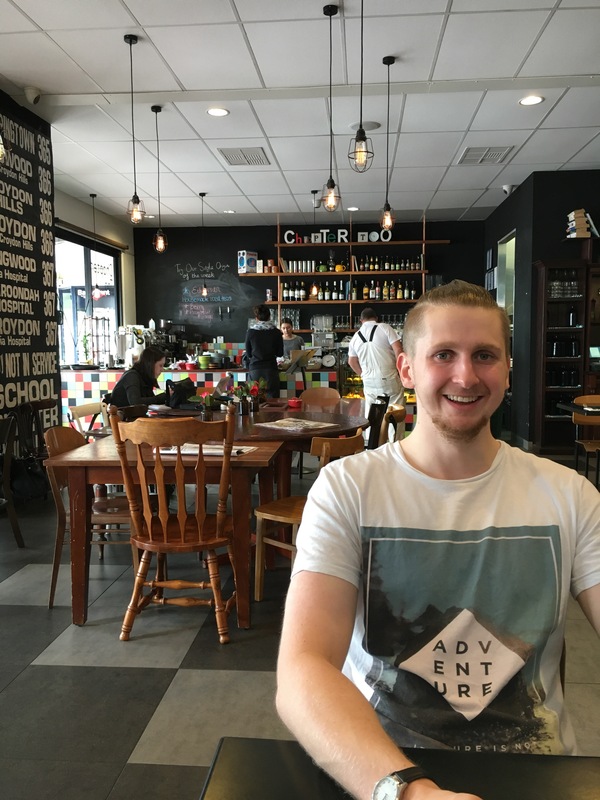 The cafe itself has a really chilled out ambience, the staff greeted us right away and were keen to help, if they were a little lacklustre. The kitchen wall of the cafe is painted in chalkboard paint, where daily specials can be written. Despite being decorated quite darkly, there’s a bright farmhouse feel to Chapter Too that softens the industrial edge; it’s definitely a place I could while away the hours! Mocha with a marshmallow? I’ll roll with that. 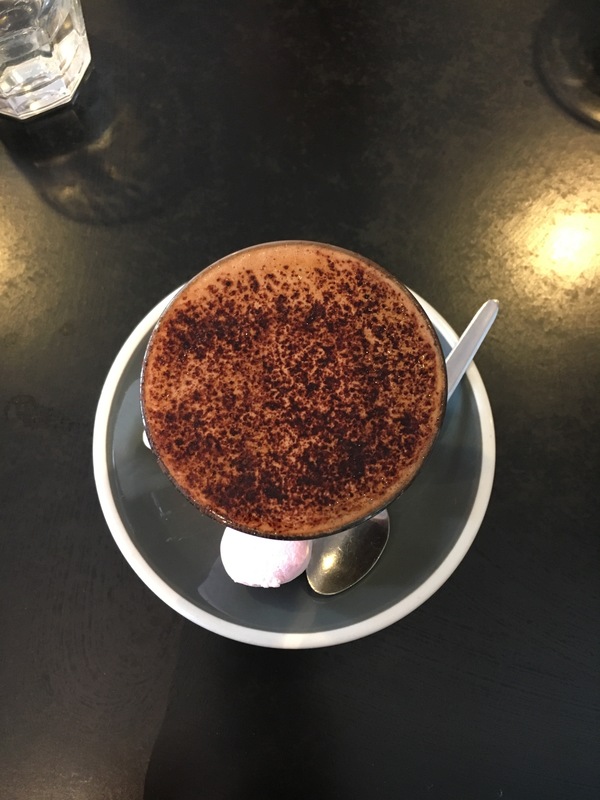 My mocha arrived with a marshmallow on the side – an interesting touch, but as everyone else had ordered hot chocolates, I was concerned my coffee fix had gone amiss. Zac did the sniff test for me (he has a strong aversion to coffee, hilarious given that he’s with me) and confirmed caffeine, but for me it was too chocolatey. It was however made with powder, not syrup, so the chocolate milk itself tasted really nice, if a little lukewarm. Our food arrived pretty quickly, we were’t in a rush as such, but with early mornings for everyone, we had forgotten just how hungry we were! So great to get some eggs Benedict in my face again! The bread was really nice, toasted well for me (if bread were steak, I like it medium rare) and I think sourdough is always a great bread to use for eggs Benedict. The yolks on the eggs were runny, than goodness and there was that incredibly satisfying moment when I cut into the egg and a rich, golden cascade of yolk poured over the bread. They looked like they’d been hand poached, which again is fast becoming my preferred way of poaching eggs. The sauce was creamy and certainly tasted like hollandaise, but there wasn’t that mustard tang that I really like – with the yolks it was all a bit ‘samey’. The ham was smoked and delicious – more like gammon than ham, thickly cut the flavour from the smoke broke up the sauce and yolk, but with the thickly cut meat the egg to sauce to bread ratio wasn’t quite there and towards the end you lost the combinations of flavours to the meat. 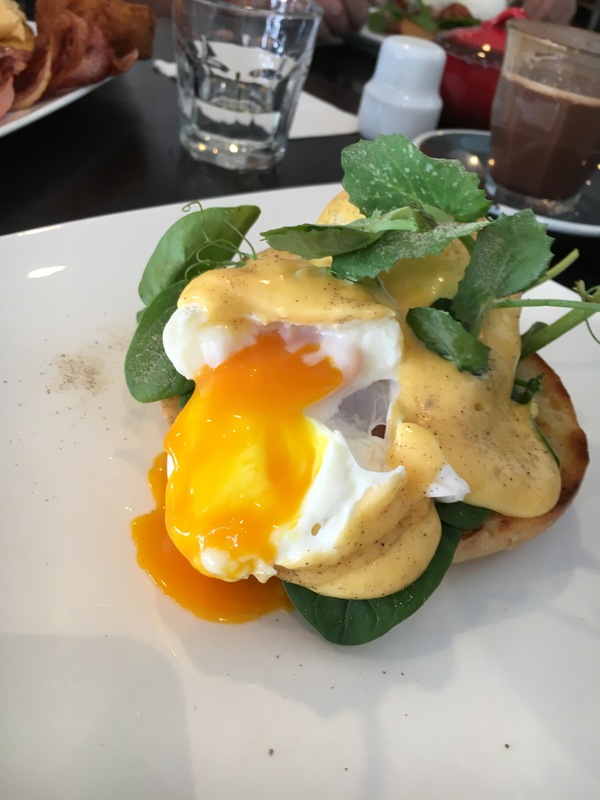 I loved the spinach: while not traditionally part of the eggs Benedict, I think it’s a great addition and the texture works in fantastic contrast to the egg and sauce and the bread and meat. The seats were comfy, the ambience great and it was a nice slide back in to brunch in Melbourne. Not the best eggs Benedict I’ve ever had, as the sauce was a little lacking for me, but the coffee was dark and rich and the location is ideal! ← things zac says when he’s sleeping.